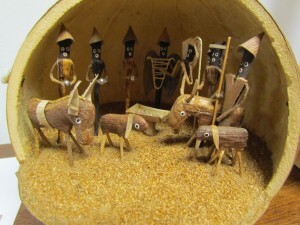 African Manger scene in a gourd. I would personally like to invite you to celebrate the birth of Christ! Join us for Christmas Eve services at 5:00 p.m. or 10:00 p.m. Our first worship service will be a family focused worship including a children’s message. Worship will center on the reading of the Christmas story and include many of our favorite Christmas carols. The 10:00 p.m. worship will be a service of candles and carols ending with the singing of Silent Night. Then Christmas Morning, at 9:30 a.m., join us for a traditional morning worship celebrating Christ’s birth with Holy Communion. Join your House of Prayer family and celebrate the birth of our Lord and Savior Jesus Christ who gives us hope and new life! This entry was posted in Home Page News, Uncategorized, Worship and tagged christmas. Bookmark the permalink.